Meet York Region’s first luxury hotel Toronto Marriott Markham now open in the heart of Downtown Markham. A stunning lobby and Draco Markham a perfect place for a glass of wine, speciality bourbon cocktail or dinner without having to travel downtown. A lovely addition for residents, businesses and visitors to the City of Markham. London. Love at first sight. My favourite city. My home away from home. When my friends make their first journey across the pond, I often share tips to help them on their way. Hopefully these are helpful to others embarking on a journey to London. • Many international flights arrive at either London Heathrow (LHR) or London Gatwick (LGW). London is also home to London City Airport (LCY) which is the closest to Central London and London Stansted (STN) located northeast of London in Essex. • Mind the Gap. Next to walking, the London Underground – more affectionately known as the Tube – is the best way to travel to, from and around central London. Definitely make sure to check signs around the city that will let you know time between Tube Stations as sometimes it is quicker to walk. Pick up a local Tube map at any Tube Station. I love planning my Tube journey as there are so many options available. While I am not a fan of the subway at home, I love the Tube and aim to hit all lines during my holiday. Investing in an Oyster Card is the most economical option. You can return it at the end of your holiday and get your deposit back. I just keep mine for my next visit and fill it when I arrive with a travel card when I arrive the Heathrow Tube Station before to heading to the city. • When travelling across the pond, I fly either Air Canada (Terminal 2) or British Airways (Terminal 5) so London Heathrow is always my final destination. I generally take the tube to Central London as it is less expensive than the Heathrow Express which takes you to Paddington Station and you may still need to take the tube or taxi to get to your accommodation. The Heathrow Express is great and quick especially if time is of the essence or you want to enjoy a quick layover in London. But if I have time on your holiday, save money by just taking the tube. The Piccadilly Line trains are used to seeing a lot luggage and there are spots for it. If you fly to Gatwick, there is a train and buses to Victoria Station which is close to Buckingham Palace. • London is expensive and this is definitely the case with accommodations. I often have pre-purchased hotel rooms via a travel provider, travel agent or with the hotel directly. Staying outside of Central London may save money but it can take longer to get to the city. If you are staying in a smaller hotel, you may be staying in the basement. I did in one hotel which I returned to a second time. Definitely check on this if you are not comfortable below ground. • If you are travelling alone, do your research to find hotels that do not charge a singles supplement as this can add a lot of money to your hotel bill. • I have tended to stay in hotels in South Kensington close to Gloucester Road Tube (Circle, District and Piccadilly Lines). My last two visits I moved beyond South Ken by renting a flat a seven minute walk from Oxford Circus as well as staying with family in Kent and commuting to London by train. While I have not used Air BNB myself, I have seen lovely flats on their website so definitely might be worth checking it out. • My favourite hotel I have stayed in is The Bailey’s Hotel London. I booked it via their website as I was staying nine nights when visiting for my cousin’s wedding. I was lucky to get a room upgrade upon my arrival and enjoyed having room service available from Olives Restaurant especially on cold December evenings. I loved the old charm of The Bailey’s Hotel, the very close proximity to the Gloucester Road Tube Station and the staff were absolutely lovely. • As a first time visitor, spend the money on a bus tour. Every few trips I take it again to see how the city has changed since my first trip in 1995 and to capture photographs of the ever evolving city. I have always gone on the Big Bus Tour – you get to see so much of the city and learn too. You can hop on and off too at various tourist attractions. The Bus has three routes – red, green and blue and also includes a cruise along the Thames River. If your travel is during the off season, your ticket may cover two days. • Buckingham Palace – you must go and see the Queen if you go to London. Green Park and Hyde Park which are nearby are also lovely to walk through. 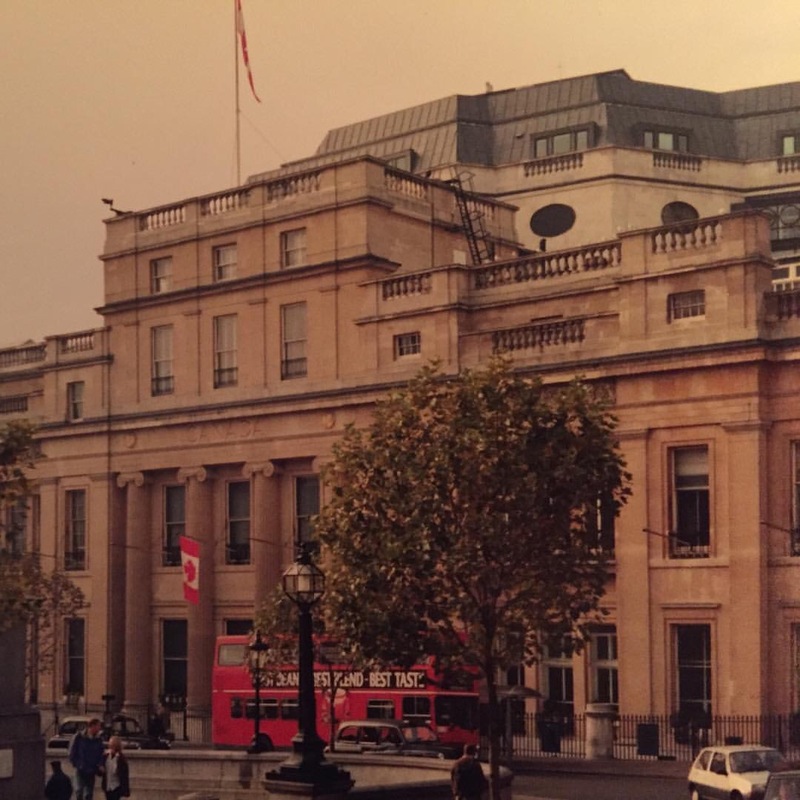 • My fellow Canadians will feel right at home in Trafalgar Square – home to Canada House. • Tower of London is an awesome attraction including the royal jewels. Definitely a great tourist attraction that children and adults alike will love. • St Paul’s Cathedral – you can climb to the top – about 500 steps and you get great views of London on a clear day. My first visit to the Cathedral, I walked the aisle and imagined Princess Diana doing it with the world watching. On one December visit, I was lucky enough to attend a candlelight Christmas Carol service. Incredibly beautiful. • Westminster Abbey is beautiful too. I went before the 2011 Royal Wedding so will likely return on a future visit. • Many London Museums including the British Museum, Victoria and Albert, National Portrait Gallery, Tate Britain, Tate Modern are free so worth visiting. I absolutely love that they are accessible to everyone and not just those who can afford it. • Go to the theatre. There are places you can purchase same tickets in the city at great deals. Leicester Square has a half price ticket office. For a bit of history, go to the Shakespeare’s Globe Theatre along the Thames River which is also a great to walk along. • The new Shard – London version of the CN Tower – is close by Borough Market. I went up at sunset and enjoyed awesome views. It is expensive so if you decide to do it make sure it is a clear day. This also applies for a spin on the London Eye which is located close to Big Ben and the Houses of Parliament. • I love to visit the main shopping streets – Oxford Street and Regent Street. Accessible from various Tube Stops: Piccadilly Circus, Oxford Circus, Bond Street and Marble Arch. • Kings Road – close to Sloane Square Tube. • There is a big mall called the Westfield at Sheppard’s Bush Tube – it is like a big Yorkdale in Toronto. I would personally much rather be on Oxford Street or somewhere else enjoying the sights but it is a way to hit alot of stores all at once. • Definitely go to Notting Hill. Best to go Saturdays mornings to really experience the buzz. Take the Tube to NottingHill Gate and follow the crowds to Portobello Road. • Whether you are a shopper or not, definitely go into Selfridges, Liberty, Fortnum and Mason, Harrods and Harvey Nichols to see them. Many have awesome food halls which are really quite amazing especially for any foodie. • I love John Lewis, Peter Jones at Sloane Square and Marks and Spencer Department Stores as I can find “reasonably” priced clothes. • There also some lovely independent shops – I often have luck at Wallis and Hobbs. • Go to Primark on Oxford Street for reasonable finds and a lot of people I know rave about the H and M store near Oxford Circus Tube. • Visit Covent Garden – they have a market on Sunday’s and there are many restaurants and bars there so you can visit any day of the week. They have little market stalls in the Jubilee Market – just off the Covent Garden Square. There are a few vendors that sell scarfs who I always visit to get a few new ones every visit. Inexpensive presents for you or family and friends. I wear these scarfs for a pop of colour with my otherwise black and navy wardrobe. • Borough Market is foodie paradise. • The Wolseley at Green Park Tube has an amazing breakfast. It is a beautiful European cafe right near the Ritz Hotel. A bit of a splurge but absolutely lovely. One must book a reservation in advance. • Crave coffee – Starbucks is scattered throughout the city but other chains also exist – AMT Coffee, Costa Coffee and Cafe Nero. Paul’s Patisserie is a lovely little bakery. The Nordic Bakery is a great for Finnish and other Scandinavian and Nordic treats. • If you like Mexican food, check out Wahaca – my sister in law’s cousin who is from Mexico took me to the Covent Garden location for dinner. A happening little place and pretty reasonably priced too. • If you find yourself in Orpington, Kent – I love the Indian takeaway from Indigo Restaurant. Love their food especially the chicken korma. • Giraffe World Kitchen is a family friendly restaurant which lots of international flavours. • Wagamama has lots of Asian noodle and vegetarian dishes. • Pizza Express is a chain restaurant which I have always had an enjoyable pizza over the past two decades. • I love Fish and Chips so always try to have it somewhere on my travels. These two spots have been recommended to me many times. One visit I hopefully finally get to them – The Golden Hind Restaurant and The Sea Shell Of Lisson Grove. • There is a yummy little takeaway place called POD Food – healthy breakfasts and lunches. • Marks and Spencers Simply Food and Pret a Manger are great place for inexpensive takeaway and easy lunches. I grab things from here lots when I am in London. I actually love popping into the grocery stores to see what is different and they often will sell reasonable meals to go. • Heddon Street Kitchen is one of Gordon Ramsay’s newest restaurants – just off Regent Street. I haven’t had an entire meal but enjoyed a tomato burrata tart and bubbles on my last visit. Definitely will go back again. • Jamie Oliver has opened a cooking school – Jamie Oliver Cookery School. I haven’t been yet but definitely plan to check it out on a future visit as I love cooking classes. • Word of advice – always pay for all meals in cash because you never want to come home to a meal that is maybe worth $20 here and your credit card shows 3X or more the amount in Canadian dollars. Paying in cash is simply less painful. I never ever feel that way if I have gone to a tourist attraction, an experience or bought myself something I loved. • Oxford is lovely. Catch the train from London Paddington. An hour train trip in the lovely English countryside. Last visit I had lovely lunch with a friend at the Cherwell Boathouse. The Oxford University campus is stunning and a must see. • Bath is a beautiful city – a two hour train trip. While I was there twenty years ago, I loved my few days there. A visit to the Roman Baths and the Pump Room for afternoon tea is essential. It is also easy to travel by bus to English Heritage site Stonehenge. • Windsor Castle is a simple trip from Central London and quite impressive. No Royal Wedding invite, no problem. Visitors are welcomed throughout the year. • Plan for the weather. Layers are always a good idea as the weather can be mixed throughout the year. I have been in late March and only needed a trench coat but the evenings were just above freezing and if it rains, it could be a bit chilly. While snow in winter isn’t as common as it is in Canada, it can paralyze the city. If you visit during the late autumn to spring, plan for the potential snow and cold temperatures. The cold is a different cold from what I am used to at home. I tend not to visit in the summer as I struggle when places are hot and lacking the extensive air conditioning that I am used to at home. Comfortable shoes are very important as you will likely be walking a lot. A Canada pin might come in handy too. • If you are bringing your mobile and plan to use it, check your plan so you don’t come home to a shocking phone bill like I have. I am with Rogers which introduced a Roam Like Home for Europe on certain plans. It is super reasonable compared to before – $10/day for a maximum of $100/month. New unlocking options may mean someone can pick up a SIM card across the pond. If you have an on-the-go charger, bring it as it can be hard to find mobile charging stations. The only one I found last visit was in the back of the John Lewis store on Oxford Street. • You will need a voltage converter for the UK. Buy it here so your mobile or camera charger prongs fit into the converter. You can buy at the airport or a luggage shop. If you are bringing a flat iron and/or hair dryer, the appliance must be dual voltage. My old flat iron wasn’t and as soon as I turned it on, there was a burning smell. Thankfully I only blew a fuse in the hotel. If you don’t have a dual voltage appliance, don’t bother bringing it with you. Save the space. If you decide to invest in one in the future, the GHD flat irons ones at Sephora – are dual voltage. I got a mini dual voltage hairdryer Avanti Mini Folding Travel Hair Dryer, 1600W, Model: AV-TRAV for the time I rented a flat but I can use it at home and abroad by adjusting the voltage button on it. • A few of my favourite websites to discover what is happening in London include Visit London, Time Out London and Visit Britain. • One of my favourite things to do is walk as much as possible and photograph the city. Trust me that you won’t be able to do everything you want in just one visit. Two decades later, I still have many things I want to see. Hope you develop your own London love affair and will want to return again and again. Till then keep calm and carry on. I always pack my carry-on liquids before arriving at the airport to ensure they all fit and if not, I can pack in my checked luggage. I love the Ziploc® medium sized bags. They are perfect for carry-on liquids and much sturdier than the bags available at the airport. Plan ahead so you don’t need to ditch your full sized liquids before security check. For more of my travel packing tips, please visit My Packing List blog post. My Packing List. I always keep one saved in my mobile phone which I can adjust depending on the destination. I definitely review on my outbound journey as I pack to ensure I don’t forget anything and avoid unnecessary purchases. I would love to say I am a smart savvy packer but truth be told I still tend to bring too much. Likely adhering to my family travel rule “If you could carry it yourself, you could bring it.” Since I can carry a lot I seem to bring more than I need. Hope you find this list a helpful resource and a great starting point to create your very own travel packing list. • Gloves if visiting a destination with a cold and/or temperate climate regardless of season. There is nothing worse than surprise weather and being super cold. I have been in this situation in June in England. Never again. • Chargers – mobile phone, iPad, camera, electric converters and adapters. I keep mine in one pouch – I have a Stella and Dot Pouf that I use for this purpose. • Toiletries Bag Essentials. With changes of the rules many things end up under the plane. Mine would include Skincare, Makeup, Make-up Remover, SPF, Shampoo, Conditioner, Hair Styling Creme, Dry Shampoo and Hair Spray – non-aerosol, Mini Perfume, Nail Polish, Nail File, Contact Lenses – Dailies, Toothpaste and Toothbrush, Floss, Deodorant and a Mini First Aid Kit. I always wrap any things I don’t want to potentially leak inside my luggage in ziplocs and then wrap my toiletries bag in another bag. A little excessive but it ensures no accidents and ruined clothing. • A luggage tag and also place my contact details inside the luggage in case it and my destination tags go missing. To discover more of my travel tips, please visit my Leaving on a Jet Plane post. Happy packing and trails to you! Many moons ago British Airways asked its followers on LinkedIn for their favourite travel tips. The post got me thinking about what travel tips I live by to make my own journey smoother. I began to craft my thoughts into a blog post, only to have it go missing and I needed to start from scratch. A lesson in the importance of being prepared for your journey. My family holiday rule growing up was always “If you could carry it yourself, you could bring it.” I learned at a young age to carry a lot. With March, Spring and Easter Breaks as well as Summer holidays on the horizon, I thought this would be a timely post to share the tips I have learned over the years to hopefully streamline someone else’s future travels. • Before booking any travel, check to see if your passport is valid for a minimum of six months. Every country has different travel rules regarding passport expiry so do your research. This is not something you want to be stressing about right before you are embarking on your holiday. Also double check you have packed your passport when you are leaving for the airport. Be prepared. • Sign up for e-mails to keep informed of seat sales and airline promotions for airlines you like to travel. On my last holiday, I lucked out with a World Traveller Plus (Premium Economy) seat for less than World Traveller (Economy) on a long-haul flight when booking during a British Airways seat sale. Much to my surprise upon boarding at London Heathrow that I found myself with an upgrade to Club World for my homeward journey. Thank you BA for the lovely experience. • Enrol in a frequent flyer program and always book through that airline even if the flight is operated through one of their code share partners. By committing to one or two airlines, it may help you build flight status quicker. Depending on the destination, I book my flights with British Airways and Air Canada – both members of different airline alliances. The One World Alliance includes British Airways as well as American Airlines, Cathay Pacific, Finnair, Iberia, Japan Airlines, LATAM Airlines, Malaysia Airlines, Qantas, Qatar Airways, Royal Jordanian, S7 Airlines and SriLankan Airlines. Star Alliance includes Air Canada, Air China, Air India, Asiana, Austrian, Lufthansa, SAS, Singapore Airlines, SWISS and United among others. Traveling via one alliance helps with a smooth transition for both passenger and their baggage during flight connections and the entire journey. • Find a carry-on and suitcase perfect for you. This sometimes takes time. I know many people love the mini suitcases. All great when you are going from home to car to terminal to car to final destination. After years of trying various bags, I finally found my perfect carry-on – the LeSportSac Avery bag. This bag has a back sleeve that unzips to go over a suitcase handle and makes my life easier when navigating the terminal, train or tube. My suitcase also has the ability to expand at the end of my voyage if additional room may be required. • Print all travel documents, confirmations, medical insurance and photocopies of your passport. Sometimes technology may fail at an important time. Always be prepared. I place all these documents in a waterproof file folder where I can safely find everything I need. It is also a great place to add receipts of purchases made on your holiday including meals and hotels so you can easily find them. • If you don’t have health insurance already in place, make sure to buy it before your travel. Even travelling outside of your own province in Canada requires different health insurance. Don’t ever take the risk and travel without it. One mini fall could end being a very costly adventure. • Email your family and/or in case of emergency contact all your flight and hotel details, important telephone numbers and your known iteniary. I also leave my family with a copy of my passport page with my photograph and details just in case it goes missing. • Charge your mobile, tablet and laptop computer before leaving for the airport to ensure all are fully charged for inspection. I also travel daily with a portable charger by Mophie to ensure I am never without a charged mobile. • If you want to use your mobile or smart phone away from home, check with your mobile plan provider about data usages prior to leaving on your travels. There is nothing worse than coming home to a shocking bill. Thankfully more affordable plans have been introduced in Canada and with the new laws to unlock mobile phones, one can purchase a SIM card at their destination. • Pack all technology power cords as well as adapters in your carry-on luggage. I place mine in a little pouch so they are all in one place. Make sure to buy your adapters in your home country so they fit the prongs for your appliances. If you are planning to travel with a hair dryer or flat iron, ensure they are dual voltage appliances so you don’t fry them or set your hotel room on fire. I almost once learned this the hard way. If they don’t have dual voltage appliance, save the space and just leave it at home. • Pack a ball point pen to fill out any customs and immigration documentation. Avoid flying with fountain pens which can cause a major ink catasphrole in flight or beyond. This happened to me when I opened my pen while attending a speaker event at the British parliament. Nothing prim, proper and graceful when your ink pen explodes navy blue all over your hands days after arriving. Even if you love fountain pens like I do, a simple old ballpoint is your safest travel friend. • Pack all your prescription and non-prescription medication together in a Ziploc® sealed bag in your carry-on luggage. Always a good idea to get a summary of your prescription medications from your pharmacist and keep the list with them in case anyone has questions. • Pre-pack your carry-on liquids at home in a clear medium Ziploc® bag to ensure you can fit everything you need for the plane. I always pack a few extra medium and large bags in case I need them for the journey home. I also take an step extra and pack my liquid products going into my suitcase in Ziploc® bags within my cosmetic case and then wrap it in another big plastic bag with ties. Yes this may be a bit extreme but it ensures no surprises of finding my clothes covered in shampoo, conditioner, moisturizer or nail polish. • On the topic of skincare and makeup, this is one time to pare down your routine and/or decant your products into smaller travel size containers. I keep ones from makeup gift with purchase events, purchase small clear bottles at the drug store or re-fill purchased minis. Just remember to label them if they are in a different and/or unmarked container. If you wish to paint your nails, a neutral colour is best so you don’t see any chips that easily. Depending on your final destination and plans while you are there, your beauty haul may be pretty minimal. If you are travelling for an event like a wedding, you may need more. Regardless of destination and the time of year, don’t forget to pack SPF. It is an everyday essential. • For clothing, stick with basics. My neutral wardrobe is mainly black and navy and I add colour through accessories such as scarves. Look at your holiday plans – will you visit cities, the country, mountains or the beach and plan ahead to find clothing that is multi-purpose and makes different outfits. I always take at least one skirt and/or dress in case I want to dress up for an evening out on the town. Always pack something for an unexpected weather change. I generally travel to cities and the countryside where jeans and layers on top work best. I wrap clothes in the clear dry cleaning bags to minimize wrinkles. Pick a few pairs of shoes and/or boots that work with many outfits. Always leave yourself some room in case you may wish to shop for yourself or bring special gifts home for someone special. • When preparing for my voyage, I always refer to my packing list for my outbound journey to ensure I don’t forget anything at home. •	Since I was a child I have always loved the ritual of going to the airport even when I am not travelling. I will often go to the airport early so I can pass through security and enjoy a coffee and/or glass of wine, a pre-flight snack and for people watching. I love the hellos, goodbyes and personal interactions of the airport so enjoy the time to just be and take in the entire travel experience. Since I do not get to travel as much as I would like, I still find the experience somewhat glamorous and luxurious and likely always will. • Check-in before you go to the airport. Generally you are able to do so 24-hours in advance of your departure. I prefer aisle seats on long-haul and overnight flights but love a window seat on a shorter flight. Airline configurations can be found on their website so you can pinpoint where you wish to sit based on the aircraft for flying. I am still fond of the Queen of the Skies – the Boeing 747 – and the newer Boeing 777 and 787 Dreamliner. • Download your selected airline’s app to your smart phone so you can easily check your flight status and for any updates when you are on the go. • While I love to look stylish, when I am flying overnight comfort is key. I always dress in layers. A t-shirt, sweater or long sleeved top, yoga pants or leggings, slip-on sneakers and a scarf or shawl to keep me warm during the flight or when one has an unexpected de-planning on the Tarmac. A t-shirt is a must as one can often get hot rushing through the airport. I may place a pair of jeans in my carry-on for a quick outfit change when I arrive at my destination if I am not wearing them already. Comfortable shoes are essential as it can be a very long walk to the gate, between gates for travel connections and in case of emergency. I also apply minimal makeup before the flight so I can I easily freshen my skin before I land and apply some makeup to get me on my way. • If you require corrective vision, opt for eye glasses vs. contact lenses as flying can be very drying for your eyes. Eye drops may be something you wish to add into your Ziploc® bag. Moisturizer and Lip Balm are other great items to include in your bag as they may be helpful throughout the flight. Limit your alcohol intake and make sure to drink plenty of water to keep yourself hydrated. • Try to get up and move as much as possible to keep your blood flow moving. At the very least move your legs and feet while seated especially if you are prone to swelling in your feet, ankles and legs after a flight. Legs up the wall and elevating your feet and legs once at your hotel destination may also be helpful too. If you have experienced this before and the symptoms are worrisome, you may wish to consult with your physician. • Plan enough time between layovers especially if you are flying from a winter destination, need to make a terminal change, pick-up luggage, clear customs and/or security, need help physically between gates or are not the fastest walker/runner. Running for your flight and missing it is no fun. • Always put your name and contact details inside your suitcase – either in the front slot or inside or both. My luggage tags once broke off my suitcase so when it got to my layover they didn’t know where to send it. It took two days and many telephone calls to the airline desk to figure out where my bag was and they only found it because I had a novel in the front pocket. • I am a pretty confident flyer and throughly enjoy the wonders of air travel but sometimes turbulence can make me anxious. I find closing my eyes and taking deep meditative breaths helps a lot. • This should go without saying but always wear your seatbelt when seated. Safety first. • Remember to treat the pilots, flight attendants and airport staff as well as fellow travellers with respect and kindness. Commit to being a better passenger. While the airlines and airport staff aim to make your journey a comfortable and enjoyable one, their number one responsibility is the safety of all passengers. Having previously been on an Air Canada flight that had a medical emergency halfway over the Atlantic Ocean, I definitely have a better appreciation for their role as our care providers in the sky. • If you use a DSLR or point and shoot camera, make sure to take two camera batteries so when you are out exploring, your camera does not die. An extra memory card may be helpful too. While I may a lot take iPhone photos at home, I love vacation photos taken with a real camera as it takes them to the next level. Thanks to digital technology one can take too many photos to produce the perfect shot. • On the occasions I have travelled on my own, I have always done a lot of research to determine where to stay, to get to know the city in advance and will often get up early to explore and retire early to my hotel to ensure I am safe after dark. For a little bit of extra security, I lean a chair underneath the door handle behind my hotel room door. Just remember to be cautious, alert and aware of your surroundings even if you have visited your destination before. • While they can be expensive, I love hotels with a hot breakfast included. They say breakfast is the most important meal of the day and on holidays this is definitely true. I find if I have a big breakfast, it takes me all the way to dinner with a coffee and sweet treat break mid-day. • Check various websites including the actual hotels sites to find the best deal. Sometimes hotels will offer incentives for longer stays. Also worth enrolling in preferred hotel programs. While I have not used it personally, I have a lot of friends who have had great success with Air BNB. • If you travel overnight, try to stay up during the day as long as possible to adjust to the new time zone. If your flight involves travelling over multiple time zones, adjust your watch when you embark on your journey to help. When I fly across the pond, I generally leave Canada at night to arrive in the morning and make sure to get outside and walk once I drop my luggage off and try to stay awake until 8 – 9 pm. This helps me get on track quickly and limits my jet-lag. For me, jet-lag is always worse travelling home and can often last an entire week. • Many times you can purchase tickets in advance for tourist attractions through a city pass or buy exercusions as part of a bus tour. Definitely do some research before you leave, make a plan for things you may want to see and explore but be open when something new and amazing presents itself. • My favourite way to remember my travels is to purchase a Christmas ornament in the places I visit. They are small and don’t take up a lot of space. I love how every December I am reminded of all the amazing travel memories. Wishing you safe journeys no matter where your travels take you. Happy Anniversary! Twenty-one years ago today we met for the first time. It was definitely love at first sight. Growing up in Canada, we had many British influences from food, music, fashion and traditions. I will always remember waking in the wee of hours of July 29th to see Prince Charles marry Lady Diana. A few years later, I was lucky to catch a glimpse of Princess Diana outside Rideau Hall when my class trip to Ottawa just happened to correspond with their Canada visit. Likely the beginning of my love and fascination with all things British. After my first year of full time employment, I embarked on a holiday to Marbella, Spain to meet a dear friend for a mini break. With no direct flights to Malaga, I flew to London Heathrow with an eight-hour layover where I decided to take full advantage of my opportunity to see the city. I hopped a bus to Central London to take a Big Bus Tour where I was immediately memorized by the charm, history and architecture. I promised to return again soon. Little did I know a week later, an unexpected airline strike would find me travelling to London a day early so I did not miss my flight home. My dad arranged for me to stay with our cousins who lived in Wembley Park. My less than 24-hour visit included being collected at Victoria Railway Station only knowing each other from printed photographs, finally meeting and getting to know my family, enjoying a lovely whirlwind underground adventure the next morning and a homemade lunch before I made the long journey home. I absolutely love everything Christmas so was dazzled by Selfridges and Oxford Street all decorated for the Christmas season. I have returned twice in December and it is truly my favourite time of year to visit. This anniversary is also a reminder that things in life don’t always go as planned but this bump in my travels led to the beginning of a beautiful friendship with my family across the pond and a lifetime love of this beautiful city. London is definitely my home away from home. London – It was definitely love at first sight that October day. No matter how many days between our visits, you are always in my heart. A true love like ours last forever.